The Perfect Way to Enjoy the Sea, Sun, and the Life in Greece. Sailing Greek Islands? Why would you want to do that? For your holidays, do you love loafing around, getting sizzled on a beach, with the biggest excitement of the day deciding what you will have for lunch? Then you are in the wrong place. If however you fancy doing something that is not too strenuous but adds a little purpose and activity to your holiday, then the perfect solution is a sailing holiday. Our accommodation came with us and all our kit was ready at hand, although we have to be a tad more efficient with our packing. We could still relax in the usual way at the beginning and end of the day. We even could have drinks and snackettes while we were travelling. There are moments of frenetic activity in the middle. Well ... alright that is not relaxing but it's great fun and provides endless tales to tell back home. Up to now we have gone for the formal flotilla although 'formal' is perhaps not quite the correct word as you can see from the adventures we had. We are considering a bare boat charter but one of us (i.e. Mr S) needs to get some sort of skippering qualification first. There are so many places to go, years could be spent just exploring all the islands, inlets etc. The Ionian is possibly the most famous for flotillas and is regarded as the least challenging with plenty of sheltered sailing. Therefore it is a good place for the inexperienced (That's us) or for those who wish to learn to sail. Read about our first two week flotilla adventure in the Ionian, part 1 and part 2, where we discovered that we loved sailing but had a lot to learn and wanted to do more sailing Greek Islands. 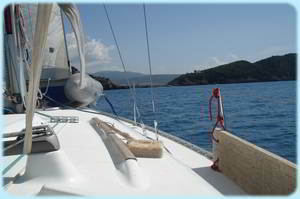 The Saronic has balanced sailing conditions with perhaps a bit more excitement than the Ionian. 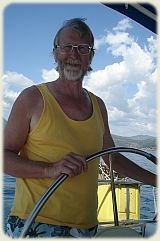 There are moderate sailing conditions, perhaps a good intermediate step after the Ionian once you become more of a salty sea dog. Has many sandy beaches. Good for intermediate sailors with northerly winds averaging force 4. The Meltemi can blow as well. The Cyclades are reputed to be the most challenging with exciting sailing. Good for more experienced sailors that prefer stronger winds. 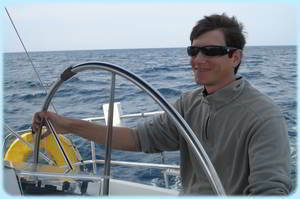 Some areas are more touristy but sailing allows you to explore more secluded bays. A more challenging sailing area with longer distances between islands than the others. So far we have only done the Ionian, but as we get more adventurous we hope to graduate up to the Saronic and then the Atlantic (well maybe not).